Hi everyone I hope you are all well. I have a Tag for you today and I made it using a Tando tag from the mega bundle pack. This is an amazing pack with different sized tags. I started with putting dimensional paste through a the bubbles thick stencil. Once dry I painted the entire tag with gesso or tinting base. 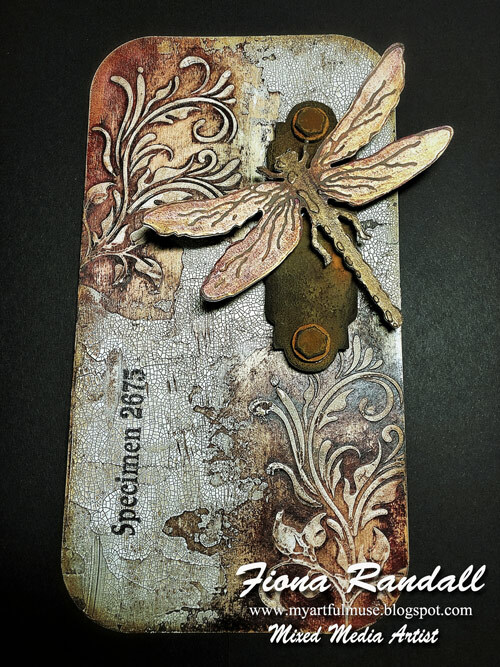 I tripple embossed a Tando circle and stamped it with a # Stampendous stamp. I used a Seth Apter die and using black cut out the circles and gave then a coat of iron ferro. Once dry I touched it up with silver Guilding wax. I sprayed the entire tag with a mix of spray inks and splatted white paint over the tag. I hope you have all enjoyed my tag. Anything Goes Week- Eternal Tag by Fiona Randall.